ProCharger supercharger kits are absolutely the most powerful and reliable supercharger systems available for your vehicle. For street use or at the track, Intercooled ProCharger supercharger systems will deliver the largest increase in horsepower and torque available from any supercharger system. And thanks to the extremely low charge air temperatures provided by ProCharger technology, ProCharger kits also provide much better engine longevity by protecting your motor from detonation. 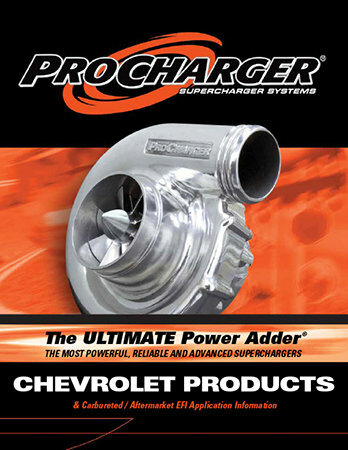 ProCharger systems are designed with a fundamental understanding of the physics behind supercharging, and are engineered to the highest quality standards. It is this approach that allows ATI to offer exclusive features which improve both the performance and reliability of ProCharger systems relative to other products. For example, it is simply an undisputed fact that lowering charge air temperatures will substantially improve both performance and engine longevity, and ATI provides the coolest intake charge air temperatures in the industry by a wide margin. Similarly, by using CNC machining and nearly indestructable 7075 T-6 aircraft aluminum to produce the largest and strongest impellers in the industry, ATI is able to again improve both performance and reliability. ProChargers are the only centrifugal superchargers to incorporate billet impellers in production models, and this is another example of ATI's technical leadership.